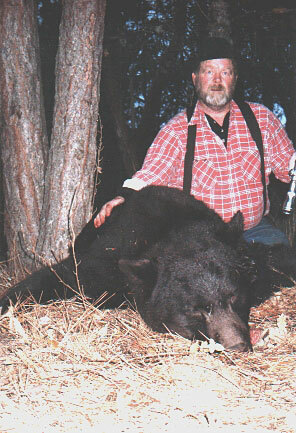 Editor's Note: Last week we incorrectly ran this story with the wrong name of the hunter who took this huge bear. Our apologies to Robert Dawson. "I got this thing on November 5, 2000 on the hill behind our house. He is 7'2" from his tail to his nose and measures 7'11" from claw to claw on his front leg reach (wingspand if he was a bird). He weighed 427 pounds after being dressed out. "Some local big game authorities have said he is a potential world record. We won't know for sure until we get the skull measured after it dries for 60 days. Regardless, I'm going to retain the right to brag and show him off all I want to. It was a fun day and one that we will all remember for a long time. All Toni has to do is figure out how to fix bear salami for breakfast, lunch, and dinner for the next year or so."